An enthusiastic and skilled researcher in Reproductive Biology, Physiology, Cell Biology, Molecular Biology and Biochemistry.  Assistant Professor (III), Amity Institute of Physiology and Allied Sciences, Amity University, Noida, UP.  Senior Research Associate (CSIR Scientists’ Pool Scheme), IICB, Kolkata, India.  Post Doctoral Research Associate (NSC), Chang Gung University, Taiwan.  Post Doctoral Research Associate (NSC), Chang Gung Memorial Hospital, Taiwan.  Post Doctoral Research Associate (CSIR), Indian Institute of Chemical Biology (IICB), Kolkata, India.  Mammalian cell (U2OS, HEK293, 293T, 293FT, HeLa, C2C12, 3T3, LNCaP, PC3, etc. & different stable clones) and Bacterial cell culture, Primary cell culture, Mouse embryonic fibroblast culture, Baterial transformation, Plasmid purification, Transfection, Lentiviral transfection, PCR, experiments with gene knockout mice.  ELISA, Western Blotting, Immunoprecipitation assay, immunofluorescence staining, fluorescent microscopy and FACS.  Protein purification by different Chromatography, Electrophoresis, Histological slide preparation, etc.  Animal handling: Laboratory rats, mice, rabbits and some surgery (ectomy), gene knockout mice breeding and experiments.  Microscopic and spectrophotometric sperm motility assay techniques, General biochemical assays, etc.  Process and instrument development by collaboration with different people with suitable expertise. Project Title: “Effect of oral exposure of arsenic on certain physiological parameters related to ovarian endocrine functions”. Advisor: Prof. Chandan Mitra, Head, Dept. of Physiology, Presidency College, Kolkata, India. St. Lawrence High School, Kolkata, India. 1. Bhoumik A., Saha S., Payghan P. V., Ghosh P., Dungdung S. R. (2018): Localization of MIF-II on mammalian spermatozoa: A study revealing its structure, function and motility inhibitory pathway. International Journal of Biological Macromolecules, 116, 633-647. 2. Ghosh P., Bhoumik A., Saha S., Mukherjee S., Azmi S., Ghosh J. K., Dungdung S. R. (2017): Spermicidal efficacy of VRP, a synthetic cationic antimicrobial peptide, inducing apoptosis and membrane disruption. Journal of Cellular Physiology, 233(2), 1041-1050. 3. Pan T. L., Hsu S. Y., Wang P. W., Cheng Y. T., Chang Y. C., Saha S., Hu J., and Ouyang P. (2015): FLJ25439, a novel cytokinesis-associate protein, induces tetraploidization and maintains chromosomal stability via enhancing expression of endoplasmic reticulum stress chaeperones. Cell Cycle, 14(8), 1174-1187. 4. Saha S., Dungdung S. R., Majumder G. C., (2014): Determination of the antioxidant potential of goat sperm cells. Oxidants and Antioxidants in Medical Science, 3(3), 195-200. 5. Bhoumik A., Saha S., Majumder G. C., Dungdung S. R. (2014): Optimum calcium concentration: a crucial factor in regulating sperm motility in vitro. Cell Biochemistry and Biophysics, 70, 1177-1183. 6. Saha S., Das S., Bhoumik A., Ghosh P., Majumder G. C. and Dungdung S. R. (2013): Identification of a novel sperm motility stimulating protein from caprine serum: its characterization and functional significance. Fertility and Sterility, 100(1), 269-279. 7. Pei Y.C., Chang T. Y., Lee T. C., Saha S., Lai H. Y., Gomez-Ramirez M., Chou S. W., Wong A. M. K. (2013): Cross-modal sensory integration of visual-tactile motion information: Instrument design and human psychophysics. Sensors, 13(6), 7212-7223. 8. Das S., Saha S., Majumder G. C. and Dungdung S. R. (2010): Purification and Characterization of a Sperm Motility Inhibiting Factor from Caprine Epididymal Plasma. PLoS ONE, 5(8): e12039 (1-12). 9. Jaiswal B. S., Das K., Saha S., Dungdung S. R., Majumder G. C. (2010): Purification and Characterization of a Motility Initiating Protein from Caprine Epididymal Plasma. Journal of Cellular Physiology, 222, 254-263. 10. Saha S., Paul D., Mukherjee A., Banerjee S., Majumder G. C. (2007): A computerized spectrophotometric instrumental system to determine the “vertical velocity” of sperm cells: a novel concept. Cytometry Part A. 71A, 308-316. 11. Mandal M., Saha S., Ghosh A. K., Majumder G. C. (2006): Identification and characterization of a sperm motility promoting glycoprotein from buffalo blood serum. Journal of Cellular Physiology, 209(2), 353-362. 12. Saha S., Paul D., Mukherjee A., Banerjee S., Majumder G. C. (2006): Development of a unique computerized spectrophotometric system with vertical movement of the cuvette for sperm motility analysis. In: Proceedings of Canadian Conference on Electrical and Computer Engineering (CCECE/CCGEI, IEEE – Ottawa, May 2006). pp. 183-186. Online Publication pp. 1399-1402, DOI: 10.1109/CCECE.2006.277432. 13. Chattopadhyay D., Dungdung S. R., Das K., Saha S., Mandal A. B., and Majumder G. C. (2005): Sperm motility inhibiting activity of a phytosterol from Alstonia macrophylla Wall ex A. DC. Leaf extract: a Tribal Medicine. Indian Journal of Experimental Biology, 43, 1104-1109. 14. Kundu C. N., Das K., Chakrabarty J., Dutta P., Bhattacharyya D., Saha S., Ghosh A., and Majumder G. C.
(2003): Development of a novel epididymal sperm model for evaluating cryoprotecting potential of various reagents. Indian Journal of Cryogenics, 28(3), 79-89. 1. Pearlman J. D., Bernstein L. H., Lev-Ari A., Saha S., Sag D., Dragoi D., Lal V. (2018): Pharmacological Agents in Treatment of Cardiovascular Diseases (Series A: Cardiovascular Diseases Book 5), Kindle Edition. (e-book) https://www.amazon.com/dp/B07MGSFDWR, Editors: Justine D. Pearlman, Larry H. Bernstein, Aviva Lev-Ari,, http://www.pharmaceuticalintelligence.com. 2. Bernstein L. H., Lev-Ari A., Williams S. J., Nallaseth F., Brook I., Saha S., Sag D., Saxena R., Barliya T., Thornton G. S. (2017): The VOICES of Patients, Hospitals CEOs, Health Care Providers, Caregivers and Families: Personal Experience with Critical Care and Invasive Medical Procedures, Kindle Edition. (e-book) https://www.amazon.com/dp/B076HGB6MZ, Editor: Gail S. Thornton, http://www.pharmaceuticalintelligence.com. 3. Bernstein L. H., Lev-Ari A., Williams S. J., Sag D., Robu I., Barliya T., Orchard-Webb D., Kaul A. F., Dragoi D., Saha S. (2017): The Immune System, Stress Signaling, Infectious Diseases and Therapeutic Implications, Kindle Edition. (e-book) https://www.amazon.com/dp/B075CXHY1B, Editor: Sudipta Saha, http://www.pharmaceuticalintelligence.com. 4. Dungdung S. R., Bhoumik, A., Saha S., Ghosh P., Das K., Mukherjee S., Nath D., Chakrabarty J., Kundu C., Jaiswal B. S., Mandal M., Maiti A., Roychowdhury M., Ray, D., Bhattacharyya D., Majumder G. C. (2016): Identification of Sperm Motility Regulatory Proteins: A Potential Approach towards Animal Reproduction. Review in Book: Insights from Animal Reproduction, Page: 161-177, Editor: Rita Payan Carreira, InTech, Rijeka, Croatia. 5. Pearlman J. D., Saxena R., Saha S., Sag D., Williams S. J., Baker M., Bernstein L. H., Lev-Ari A., Sonnenberg A. (2015): Regenerative and Translational Medicine: The Therapeutic Promise for Cardiovascular Diseases, Kindle Edition. (e-book) http://www.amazon.com/dp/B019UM909A, Editors: Larry H Bernstein, Aviva Lev-Ari, http://www.pharmaceuticalintelligence.com. 6. Pearlman J. D., Williams S. J., Barliya T., Saha S., Stoicescu M. Vatsa A., Lev-Ari A., Bernstein L. H., Sonnenberg A. (2015): Etiologies of Cardiovascular Diseases: Epigenetics, Genetics and Genomics, Kindle Edition. (e-book) http://www.amazon.com/dp/B018PNHJ84, Editors: Aviva Lev-Ari, Larry H Bernstein, http://www.pharmaceuticalintelligence.com. 7. Saha S., Saxena R., Barlyia T., Sarkar A., Feldman M. W., Sag D., Bernstein L. H., Williams S. J., Lev-Ari A., Sonnenberg A. (2015): Genomics Orientations for Personalized Medicine (Frontiers in Genomics Research Book 1) Kindle Edition. (e-book) http://www.amazon.com/dp/B018DHBUO6, Editors: Larry H Bernstein, Aviva Lev-Ari, Stephen J. Williams, http://www.pharmaceuticalintelligence.com. 8. Majumder G. C., Saha S., Das K., Nath D., Maiti A., Dey S., Roy D., Dey CS., Mitra S., Rana A., Chakrabarty J., Das S., Bhoumik A., Banerjee S., Mandal M., Jaiswal B. S., Ghosh P., Das A., Bhattacharyya D., and Dungdung S. R. (2015): Role of Sperm Surface Molecules in Motility Regulation.Review in Book: Mammalian Endocrinology and Male Reproductive Biology, Page: 197-244, Editor: Shiokumar Singh, CRC Press, Taylor & Francis Asia Pacific, New Delhi, India. 9. Bernstein L. H., Kandala P., Lev-Ari A., Saha S., Saxena R., Williams S., Sonnenberg A. (2015): Metabolic Genomics & Pharmaceutics: Volume I (BioMedicine – Metabolomics, Immunology, Infectious Diseases Book 1) Kindle Edition. (e-book) http://www.amazon.com/dp/B012BB0ZF0, Editor: Larry H Bernstein, http://www.pharmaceuticalintelligence.com. 10. Majumder G. C., , Das K., Saha S., Nath D., Maiti A., Das S., Dey N., Banerjee S., Barua M., Mandal M., Jaiswal B. S., Biswas R., Bhoumik A., Roy D., Dey S., Som J., Bhattacharyya D., Dungdung S. R. (2012): Purification and Characterization of Novel Sperm Motility-Related Proteins. (Review) Protein Purification, Page: 1-90 Editors: Miguel Benitez and Victoria Aguirre, Nova Science Publishers Inc., USA. 1. D. Paul, G. C. Majumder, S. Saha, A. Mukherjee, S. Banerjee. A spectrophotometric system for measurement of vertical velocity of clinical and biological samples. Indian Patent Application Filed – No. 1605/DEL/2004, Date: 26.08.2004. Indian Patent Granted: Patent No. IN264556, Date of Grant: 06.01.2015, International Classification: G01N 21/25. International PCT Patent Application Filed – PCT/IB05/02541. 1. “Global Medical Discovery” listed our paper in 2013 on goat serum motility promoting protein as a potential bio-molecule for future drug discovery. 2. “News Online” reported our work on the sperm vertical velocity measuring instrumental system in their September 2009 issue on 14th September 2009 following “Indo-US Honorable Mention Award”. 3. “The Telegraph” has reviewed our work on the sperm vertical velocity measuring instrumental system in the “Know How” scientific section on May 14, 2007. 4. “Down to Earth” the renowned science and technology magazine has reviewed our work on buffalo serum motility promoting protein on January 15, 2007. 5. “The Statesman” has reviewed our work on buffalo serum motility promoting protein on January 10, 2007. 1. Awarded Best Poster Award, Bangalore India Bio, 2011. 2. Awarded Honorable Mention Award in India Innovation Pioneers Challenge Business Plan Competition, Indo-US Science & Technology Forum, New Delhi, 2009. 3. Finalist in BioAsia Innovation Award, BioAsia, Hyderabad, 2009. 4. Finalist in Ranbaxy Young Scientist Award, Ranbaxy Research Laboratories, Gurgaon, 2008. 5. Awarded Biotech Idea to Innovation Award, British Council, New Delhi, 2007. 6. Awarded Best Poster Award, International Congress On Gamete Biology: Emerging Frontiers In Fertility And Contraceptive Development, National Institute of Immunology, New Delhi, 2006. 7. Awarded National Scholarship for getting Star Marks in Madhyamick Pariksha, National Scholarships Scheme, Govt. of West Bengal, 1994. 1. Participation in the “Hands-on Basic Flow Cytometry Course” during 17 – 21 December 2009, by Centre for Cellular and Molecular Platform (C-CAMP) at National Centre for Biological Sciences (NCBS), Bangalore. (Training on Becton Dicson (BD) FACS Aria). 2. Participation in “CSIR 6th Technology Led Entrepreneurship Programme 2009” during 1 – 26 June 2009, by Indian Institute of Management – Bangalore faculties, at Indian Institute of Chemical Technology, Hyderabad. 3. Participation in “Effective Communication & Scientific Writing Skill Development Workshop” on 26th February – 3rd March 2009, by The Centre for Personal Transformation, at Indian Institute of Chemical Biology, Kolkata. 4. Participation in “Users’ Training Programme on CSIR E-Journals Consortium” on 21st August 2006 at Indian Institute of Chemical Biology, Kolkata. 5. Participation in Workshop on “Laboratory Safety on Biological, Chemical & Radiation Hazzards” in 2005 at Indian Institute of Chemical Biology, Kolkata. 6. Participation in Workshop on “Electron Microscopy For Beginners” in 2003 at Jadavpur University, Kolkata.  Society of Biological Chemists, India – Life Member since 2002.  Indian Science Congress Association – Life Member since 2004.  London, United Kingdom – 2007.  Chicago, USA – 2010, 2011.  Bangkok, Thailand – 2010.  Taipei, Taiwan – 2011, 2012, 2013, 2014, 2015.  Training Consultant in British Council’s “Darwin Now” programme, 2010.  Judge in the British Council’s School Debate 2008 entitled “Debating Matters, India”.  Participated in various inter-organization competitive cricket tournaments of IICB and CSIR during 2002-2011 & 2015. Played for Royal Indian Cricket Club, Taiwan during 2012-2015.  Cell cycle regulation plays a pivotal role in controlling cell proliferation and survival. Aberrant expression of cell cycle- associated genes generally afflicts cells with tumor-prone characteristics and promotes chromosome instability. FLJ10540 (Centrosome Protein 55kDa: Cep55) was identified recently as an important regulator of cytokinesis involved in cell growth and proliferation. Thus Cep55 may be considered for cancer regulation. Other than this testis is one of the tissues with most prominent Cep55 expression. Therefore, it must have some role related to testicular cell cycle progression. FLJ25439, a novel protein found in our laboratory (Cell Cycle, 2015), was also found to be expressed exclusively in testis and preliminarily found to be an interacting partner of Cep55. In this study, we generated Cep55 Knockout (KO) mice by microinjection of embryonic stem (ES) harboring Cep55 null allele into blastocysts and chimera mice produced were then mated with wild type (WT) C57BL/6 mice. Heterozygous (-/+) mice from different litters were then mated to finally get homozygous (-/-) mice which showed proportionate dwarfism with balancing problem and short life span. Thus, complete knockout of Cep55 may be detrimental to cell division (in vivo) and development of embryo. Dr. Sudipta Saha, Ph. D.
An enthusiastic and skilled researcher in Reproductive Biology, Physiology, Cell Biology, Molecular Biology and Biochemistry looking for a suitable position. An Indian Patent has been granted for the development of Sperm Vertical Velocity Analyzer (SPERMA). The PCT / International Patent Application status is yet to be known. I did my masters degree in Physiology with specialization in Endocrinology and Reproductive Physiology from Presidency College, Kolkata. I continued my interest in the field of reproductive biology as a Ph. 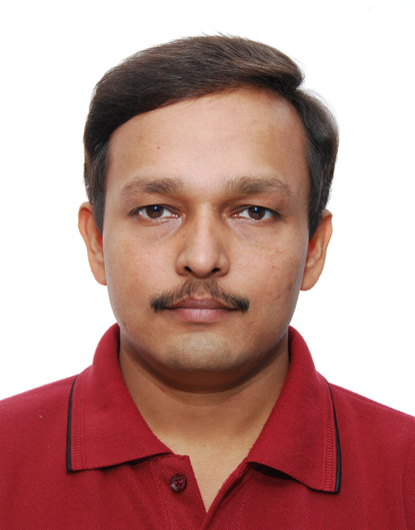 D. research scholar at the Indian Institute of Chemical Biology (a CSIR unit). During my Ph.D., I worked on sperm motility. Sperm motility is a determinant factor in the process of fertilization. We found serum of goat (also buffalo) contains an active factor that increases sperm motility to a much higher degree than the known motility promoters. The active molecule was purified from goat serum (also buffalo: Journal of Cellular Physiology., 2006, 209(2), 353-362) and characterized for its biochemical and physiological properties. During this biochemical study, I found that the limitation of measuring sperm velocity is restricted on the horizontal plane only. Unfortunately, vertical movement was always ignored, perhaps because of instrumental limitations. Movement against the gravity is always difficult and requires more energy. According to our perception, vertical velocity may provide a better index for sperm fertility potential. This idea was put forward and with the collaboration of engineers and software professionals, we developed a spectrophotometer based computerized sperm vertical velocity measuring instrumental system. (Cytometry Part A., 2007, 71A, 308-316; Patents: PCT/IB05/02541 & 1605/DEL/2004). After my Ph.D., I continued to work on the same field in Indian Institute of Chemical Biology as a Research Associate. Presently I am working as a Research Associate in Chang Gung Memorial Hospital, Taiwan on the topic “Effect of tactile stimulus on the somatosensory cortex of the brain, integration of visual and tactile stimulus and its application in the rehabilitation of stroke patients”. I wish to pursue my career related to science directly or indirectly (research or non-research). I am hard working and highly motivated, and ready to take on new assignments in the areas of health care, biotechnology, science media & publications or science management utilizing 9 years of experience in leading scientific research. I am a Ph.D. in Biology (Science) and my doctorate was both much awarded (“Biotech Idea to Innovation Award” from the British Council, “Honourable Mention Award” from the Indo-US Science and Technology Forum, etc. ), prolific (7 peer-reviewed international papers, 2 patents pending) and generated significant general interest (4 press mentions). I also got the chance to participate in Business entrepreneurship mentoring sessions at 6th CSIR Technology Led Entrepreneurship Programme 2009, IICT, Hyderabad and Indian School of Business (ISB), Hyderabad in 2009 related to my research. To me, biology research meant more than laboratory work; it developed my skills for innovation, interdisciplinary collaboration, international experience, presentation, teaching and mentoring, stakeholder communication, lateral thinking and overall discipline. I seek a position where I can apply all of the above experiences to enjoy my work and add value to my employer. Post Doctoral Research Associate (CSIR), Indian Institute of Chemical Biology, Kolkata, India. Post Doctoral Research Associate (NSC), Chang Gung University, Taiwan. Mammalian cell (U2OS, HEK293, 293T, 293FT, HeLa, C2C12, 3T3, LNCaP, PC3, etc. & different stable clones) and Bacterial cell culture, Primary cell culture, Mouse embryonic fibroblast culture, Baterial transformation, Plasmid purification, Transfection, Lentiviral transfection, PCR, experiments with gene knockout mice. ELISA, Western Blotting, Immunoprecipitation assay, immunofluorescence staining, fluorescent microscopy and FACS. Protein purification by different Chromatography, Electrophoresis, Histological slide preparation, etc. Animal handling: Laboratory rats, mice, rabbits and some surgery (ectomy), gene knockout mice breeding and experiments. Microscopic and spectrophotometric sperm motility assay techniques, General biochemical assays, etc. Manuscript writing for paper publication, Preparing powerpoint slides and scientific lecture presentation. Process and instrument development by collaboration with different people with suitable expertise. System neuroscience experiments on human and nonhuman primates. Thesis Title: “A novel method of sperm motility analysis and characterisation of a sperm motility promoting protein from goat blood serum”. Advisor: Dr. G. C. Majumder and Dr. S. R. Dungdung, Sperm Biology Laboratory, Cell Biology and Physiology Division, CSIR-Indian Institute of Chemical Biology, Kolkata, India. Pan T. L., Hsu S. Y., Wang P. W., Cheng Y. T., Chang Y. C., Saha S., Hu J., and Ouyang P. (2015): FLJ25439, a novel cytokinesis-associate protein, induces tetraploidization and maintains chromosomal stability via enhancing expression of endoplasmic reticulum stress chaeperones. Cell Cycle, 14(8), 1174-1187. Saha S., Dungdung S. R., Majumder G. C., (2014): Determination of the antioxidant potential of goat sperm cells. Oxidants and Antioxidants in Medical Science, 3(3), 195-200. Bhoumik A., Saha S., Majumder G. C., Dungdung S. R. (2014): Optimum calcium concentration: a crucial factor in regulating sperm motility in vitro. Cell Biochemistry and Biophysics, 70, 1177-1183. Saha S., Das S., Bhoumik A., Ghosh P., Majumder G. C. and Dungdung S. R. (2013): Identification of a novel sperm motility stimulating protein from caprine serum: its characterization and functional significance. Fertility and Sterility, 100(1), 269-279. Pei Y.C., Chang T. Y., Lee T. C., Saha S., Lai H. Y., Gomez-Ramirez M., Chou S. W., Wong A. M. K. (2013): Cross-modal sensory integration of visual-tactile motion information: Instrument design and human psychophysics. Sensors, 13(6), 7212-7223. Das S., Saha S., Majumder G. C. and Dungdung S. R. (2010): Purification and Characterization of a Sperm Motility Inhibiting Factor from Caprine Epididymal Plasma. PLoS ONE, 5(8): e12039 (1-12). Jaiswal B. S., Das K., Saha S., Dungdung S. R., Majumder G. C. (2010): Purification and Characterization of a Motility Initiating Protein from Caprine Epididymal Plasma. Journal of Cellular Physiology, 222, 254-263. Saha S., Paul D., Mukherjee A., Banerjee S., Majumder G. C. (2007): A computerized spectrophotometric instrumental system to determine the “vertical velocity” of sperm cells: a novel concept. Cytometry Part A. 71A, 308-316. Mandal M., Saha S., Ghosh A. K., Majumder G. C. (2006): Identification and characterization of a sperm motility promoting glycoprotein from buffalo blood serum. Journal of Cellular Physiology, 209(2), 353-362. Saha S., Paul D., Mukherjee A., Banerjee S., Majumder G. C. (2006): Development of a unique computerized spectrophotometric system with vertical movement of the cuvette for sperm motility analysis. In: Proceedings of Canadian Conference on Electrical and Computer Engineering (CCECE/CCGEI, IEEE – Ottawa, May 2006). pp. 183-186. Online Publication pp. 1399-1402, DOI: 10.1109/CCECE.2006.277432. Chattopadhyay D., Dungdung S. R., Das K., Saha S., Mandal A. B., and Majumder G. C. (2005): Sperm motility inhibiting activity of a phytosterol from Alstonia macrophylla Wall ex A. DC. Leaf extract: a Tribal Medicine. Indian Journal of Experimental Biology, 43, 1104-1109. Kundu C. N., Das K., Chakrabarty J., Dutta P., Bhattacharyya D., Saha S., Ghosh A., and Majumder G. C. (2003): Development of a novel epididymal sperm model for evaluating cryoprotecting potential of various reagents. Indian Journal of Cryogenics, 28(3), 79-89. Majumder G. C., , Das K., Saha S., Nath D., Maiti A., Das S., Dey N., Banerjee S., Barua M., Mandal M., Jaiswal B. S., Biswas R., Bhoumik A., Roy D., Dey S., Som J., Bhattacharyya D., Dungdung S. R. (2012): Purification and Characterization of Novel Sperm Motility-Related Proteins. (Review) Protein Purification, Page: 1-90 Editors: Miguel Benitez and Victoria Aguirre, Nova Science Publishers Inc., USA. Bernstein L. H., Kandala P., Lev-Ari A., Saha S., Saxena R., Williams S., Sonnenberg A. (2015): Metabolic Genomics & Pharmaceutics: Volume I (BioMedicine – Metabolomics, Immunology, Infectious Diseases Book 1) Kindle Edition. (e-book) http://www.amazon.com/dp/B012BB0ZF0, Editor: Larry H Bernstein, http://www.pharmaceuticalintelligence.com. Majumder G. C., Saha S., Das K., Nath D., Maiti A., Dey S., Roy D., Dey CS., Mitra S., Rana A., Chakrabarty J., Das S., Bhoumik A., Banerjee S., Mandal M., Jaiswal B. S., Ghosh P., Das A., Bhattacharyya D., and Dungdung S. R. (2015): Role of Sperm Surface Molecules in Motility Regulation.Review in Book: Mammalian Endocrinology and Male Reproductive Biology, Page: 197-244, Editor: Shiokumar Singh, CRC Press, Taylor & Francis Asia Pacific, New Delhi, India. Saha S., Saxena R., Barlyia T., Sarkar A., Feldman M. W., Sag D., Bernstein L. H., Williams S. J., Lev-Ari A., Sonnenberg A. (2015): Genomics Orientations for Personalized Medicine (Frontiers in Genomics Research Book 1) Kindle Edition. (e-book) http://www.amazon.com/dp/B018DHBUO6, Editors: Larry H Bernstein, Aviva Lev-Ari, Stephen J. Williams, http://www.pharmaceuticalintelligence.com. Pearlman J. D., Williams S. J., Barliya T., Saha S., Stoicescu M. Vatsa A., Lev-Ari A., Bernstein L. H., Sonnenberg A. (2015): Etiologies of Cardiovascular Diseases: Epigenetics, Genetics and Genomics, Kindle Edition. (e-book) http://www.amazon.com/dp/B018PNHJ84, Editors: Aviva Lev-Ari, Larry H Bernstein, http://www.pharmaceuticalintelligence.com. Pearlman J. D., Saxena R., Saha S., Sag D., Williams S. J., Baker M., Bernstein L. H., Lev-Ari A., Sonnenberg A. (2015): Regenerative and Translational Medicine: The Therapeutic Promise for Cardiovascular Diseases, Kindle Edition. (e-book) http://www.amazon.com/dp/B019UM909A, Editors: Larry H Bernstein, Aviva Lev-Ari, http://www.pharmaceuticalintelligence.com. Paul, G. C. Majumder,S. Saha, A. Mukherjee, S. Banerjee. Computer based spectrophotometric system to determine vertical velocity of clinical and biological samples. International PCT Patent Application Filed – PCT/IB05/02541. Paul, G. C. Majumder,S. Saha, A. Mukherjee, S. Banerjee. A unique computer based spectrophotometric system with multiple height exposures of the cuvette to determine vertical velocity of spermatozoa for clinical and biological applications. Indian Patent Application Filed – No. 1605/DEL/2004. “The Statesman” has reviewed our work on buffalo serum motility promoting protein on January 10, 2007. “Down to Earth” the renowned science and technology magazine has reviewed our work on buffalo serum motility promoting protein on January 15, 2007. “The Telegraph” has reviewed our work on the sperm vertical velocity measuring instrumental system in the “Know How” scientific section on May 14, 2007. “News Online” reported our work on the sperm vertical velocity measuring instrumental system in their September 2009 issue on 14th September 2009 following “Indo-US Honorable Mention Award”. “Global Medical Discovery” listed our paper in 2013 on goat serum motility promoting protein as a potential bio-molecule for future drug discovery. Awarded Best Poster Award, International Congress On Gamete Biology: Emerging Frontiers In Fertility And Contraceptive Development, National Institute of Immunology, New Delhi, 2006. Awarded Biotech Idea to Innovation Award, British Council, New Delhi, 2007. Awarded Honorable Mention Award in India Innovation Pioneers Challenge Business Plan Competition, Indo-US Science & Technology Forum, New Delhi, 2009. Awarded Best Poster Award, Bangalore India Bio, 2011. Finalist in BioAsia Innovation Award, BioAsia, Hyderabad, 2009. Finalist in Ranbaxy Young Scientist Award, Ranbaxy Research Laboratories, Gurgaon, 2008. Awarded National Scholarship for getting Star Marks in Madhyamick Pariksha, National Scholarships Scheme, Govt. of West Bengal, 1994. Participation in Workshop on “Electron Microscopy For Beginners” in 2003 at Jadavpur University, Kolkata. Participation in Workshop on “Laboratory Safety on Biological, Chemical & Radiation Hazzards” in 2005 at Indian Institute of Chemical Biology, Kolkata. Participation in “Users’ Training Programme on CSIR E-Journals Consortium” on 21st August 2006 at Indian Institute of Chemical Biology, Kolkata. Participation in “Effective Communication & Scientific Writing Skill Development Workshop” on 26th February – 3rd March 2009, by The Centre for Personal Transformation, at Indian Institute of Chemical Biology, Kolkata. Participation in “CSIR 6th Technology Led Entrepreneurship Programme 2009” during 1 – 26 June 2009, by Indian Institute of Management – Bangalore faculties, at Indian Institute of Chemical Technology, Hyderabad. Participation in the “Hands-on Basic Flow Cytometry Course” during 17 – 21 December 2009, by Centre for Cellular and Molecular Platform (C-CAMP) at National Centre for Biological Sciences (NCBS), Bangalore. (Training on Becton Dicson (BD) FACS Aria). Society of Biological Chemists, India – Life Member since 2002. Indian Science Congress Association – Life Member since 2004. London, United Kingdom – 2007. Chicago, USA – 2010, 2011. Taipei, Taiwan – 2011, 2012, 2013, 2014, 2015. Training Consultant in British Council’s “Darwin Now” programme, 2010. Judge in the British Council’s School Debate 2008 entitled “Debating Matters, India”. Participated in various inter-organization competitive cricket tournaments of IICB and CSIR during 2002-2011 & 2015. Cell cycle regulation plays a pivotal role in controlling cell proliferation and survival. Aberrant expression of cell cycle- associated genes generally afflicts cells with tumor-prone characteristics and promotes chromosome instability. FLJ10540 (Centrosome Protein 55kDa: Cep55) was identified recently as an important regulator of cytokinesis involved in cell growth and proliferation. Thus Cep55 may be considered for cancer regulation. Other than this testis is one of the tissues with most prominent Cep55 expression. Therefore, it must have some role related to testicular cell cycle progression. FLJ25439, a novel protein found in our laboratory (Cell Cycle, 2015), was also found to be expressed exclusively in testis and preliminarily found to be an interacting partner of Cep55. In this study, we generated Cep55 Knockout (KO) mice by microinjection of embryonic stem (ES) harboring Cep55 null allele into blastocysts and chimera mice produced were then mated with wild type (WT) C57BL/6 mice. Heterozygous (-/+) mice from different litters were then mated to finally get homozygous (-/-) mice which showed proportionate dwarfism with balancing problem and short life span. Thus, complete knockout of Cep55 may be detrimental to cell division (in vivo) and development of embryo.